So I finally have word on the way we are proceeding. Thanks to everyone for being so patient. We are acutely aware of tens of thousands of supporters around the world who want another chance to participate in the project. First of all, I want to address why things have taken so long. Behind the scenes we have been working incredibly hard to explore funding directions that allow broader participation, including the possibility of running an ICO. The challenge, of course, is that the regulatory environment has become more difficult after the fundraising frenzy of 2017, with many of those raising funds via ICOs recently receiving subpoenas. This means that missteps can have serious consequences. The DFINITY “Internet Computer” project aims to deliver an open network that can provide tremendous utility, encompasses years of work and is supported by a brilliant growing team. There is simply too much at stake to risk. The lowdown is the following. It is impractical for us to run an “ICO” right now, even though we have been exploring every avenue possible. To widen distribution of our network tokens, we will conduct an airdrop of dfinities worth up to 25 million Swiss francs to select community members, with preference given to those who have been supporting the project for some time. The precise details are still being finalized, however U.S. entities will be unable to participate due to regulatory issues. Prior to the airdrop, we will also run a private “Presale” fundraiser of limited size. The DFINITY Foundation was created to progress development of our “Internet Computer” technology and create Cloud 3.0 from an open decentralized network. When the network launches, its “genesis state” will contain initial allocations of dfinity tokens used to mediate participation. Tokens will be needed by users to pay for computation and storage, by miners to connect special “full node” hardware (of the type that interacts through the protocol to create the Internet Computer) and by participants to influence the decentralized algorithmic governance system, among other things. The foundation is responsible for defining the official genesis state. The foundation is a Swiss not-for-profit organization that pursues objectives defined in a special “notarial deed” — primarily, developing Internet Computer technology and promoting a successful network — and can sell batches of tokens in the genesis state to fund its operations. When the foundation was formed, 9.5% of the tokens were allocated to numerous early contributors including entities that had been bankrolling developer salaries, legal and other expenses, and team members, some of whom had been working unpaid for years and contributed substantial intellectual property. The remaining 90.5% then became an “endowment” to be used funding operations and incentivizing the best talent. Back when the DFINITY project had a lower profile —before the ICO craze began — the foundation ran a “Seed” round that disbursed 24.72% of the tokens. Recently, a widely reported “Strategic” round negotiated in the fall of 2017 completed that disbursed another 6.84% of the tokens. We now are selling another 4.75% of the tokens in a “Presale” round, and will also airdrop another 1.25% to select community members. This will leave the foundation with a very substantial token endowment. Our endowment tokens are expected to fund aggressive operation for years in the mode of an agile Silicon Valley startup (which is the best way to make the Internet Computer a mass market phenomenon). They can be sold to raise funds for salaries and offices, granted to team members to help attract and motivate the world’s best talent, for acquisitions of technology and teams, and many other potential purposes. After our Presale fundraise, no further rounds are expected before network launch. DFINITY does not define itself in terms of a “blockchain project”. We strongly believe that all decentralized projects, including the “Internet Computer”, should only value themselves in terms of the real world utility they provide and how their features fit with their intended audience. The DFINITY project is creating an Internet Computer and developer stack that, for those building specific types of business system, is intended to provide a demonstrably superior open alternative to the traditional software stack (comprised from software such as databases, Web servers and IDEs and commercial cloud computing services such as AWS and Google Cloud) and also power a new breed of “open source” decentralized business and social media system. While the Internet Computer platform itself will be easily accessible by developers and users of its applications, the underlying requirements of the systems involved are highly complex to design and implement. For example, we recently described our Threshold Relay and Probabilistic Slot Consensus blockchain protocols in the first of a new series of white papers. Those novel protocols produce a “random beacon” and blockchain system that greatly outperforms other designs with respect to finalization speed and security (as demonstrated last October). But this is just one of many complex pieces of the puzzle involved in fulfilling our precise product requirements— DFINITY involves novel cryptography, distributing computing protocols, virtual machines (DFINITY builds on WebAssembly, whose co-creator is part of the team, to produce a deterministic multi-threading virtual computer), programming language design, IDEs, algorithmic governance, hardware and other specialized work. 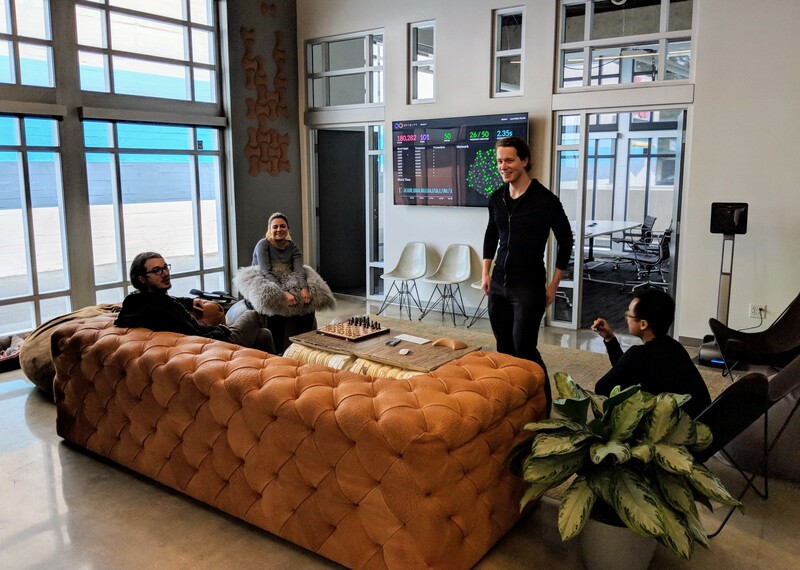 Consequently, our technical recruiting focuses on highly experienced senior researchers and engineers, many of whom already have track records creating important new math and technology and join us from technology giants such as Google. In this our needs are very different to those projects running much simpler “proof of concept” smart contract platforms that may be unlikely to ever achieve mass adoption, or even support meaningful production business systems. We need a stable organization that can hire and retain these senior personnel and provide them with an environment within which they can focus on our more complex task. To support our growing senior team, we have been building out what we term a “NASA for decentralization”. The organization must do much more than R&D — it must also support the live network in a way that makes it a better platform solution. Our vision involves the Internet Computer eventually hosting millions of traditional and decentralized business systems (AWS, for example, recently passed 1M customers). We believe the concept of a handful of developers creating such a platform by simply releasing a blockchain protocol with supporting software is wholly unrealistic, or at the least very sub-optimal. Consequently, among other things, the DFINITY Foundation must build out a security team distributed across time zones around the world that performs 24/7 threat analysis and mitigation, and run an operations team that supports users needing assistance patching broken systems or mitigating hacks by jointly authoring proposals to the Blockchain Nervous System. 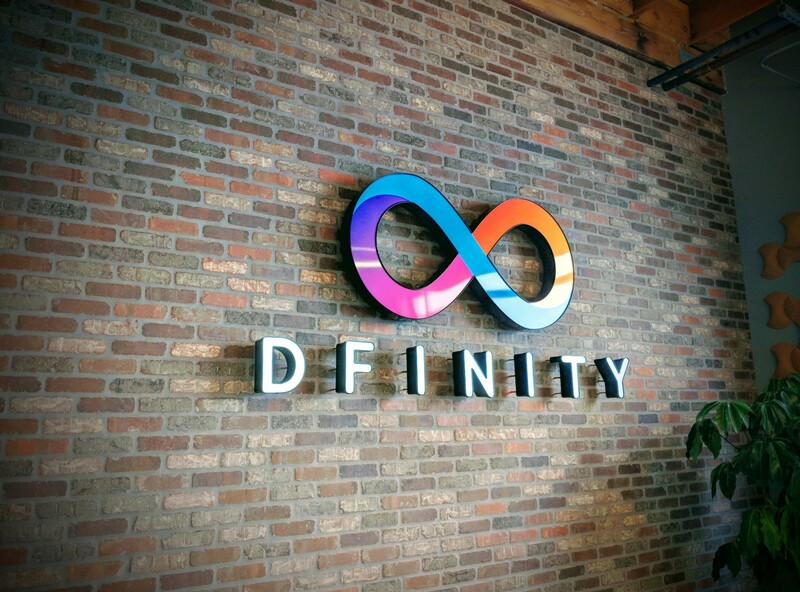 We are planning for a future where the DFINITY Foundation eventually employs hundreds of highly skilled personnel. We already have teams distributed across Switzerland, the USA (with a primary research center in Palo Alto), Germany and Japan. Currently this is the main purpose of funds, but funding can also be used to insure against unforeseen eventualities and for things like acquiring external teams and technologies. For reasons I expand on in following sections, raising funds by running a traditional “ICO” is not in the best interests of the project, even though we would very much like to please the crowd and run one. Nonetheless, we still want to increase the distribution of dfinity tokens before the network launches — whereupon we expect dfinity network tokens to become more widely distributed via third party exchanges. We have determined that the best way forward is to perform an airdrop where participants must submit to KYC and AML processes. Recipients will be able to use their tokens to start experimenting with the platform and developing applications as soon as the network goes live. We hoped giving away dfinities would be straightforward. However, it turns out that in the USA even giving away dfinity tokens for free before the network has launched can still be classified as an unregulated public securities transaction. For such reasons, we will restrict the airdrop to non-US persons. The exact details of the airdrop subject to complete change as we are still finalizing complexities. The current thinking is that individual community members will be able to collect dfinity tokens worth between 500 and 2,500 CHF (depending on their personal airdrop cap, which will be derived from duration of community tenure and other inputs). We are planning to give away tokens worth up to 25,000,000 CHF. Work has already begun constructing whitelists based on community data available to us. More information will be provided in the next few weeks as we work the mechanisms involved. Please read the warning below before even thinking about participating. To date, numerous fake DFINITY investment schemes have been run by criminals to defraud people out of funds they wanted to contribute to the project. Please remember that WE WILL NOT be operating any public token sales and that after this announcement you should now expect fraudsters and criminals to also create plenty of FAKE DFINITY AIRDROP SCHEMES. ALL TOKEN SALES ARE SCAMS. The DFINITY Foundation is committed to a strategy of continuously expanding R&D to push the boundaries of what is possible and supporting the Internet Computer network in operation. To fund operations we are moving forward with a private “Presale” fundraise, which we strongly expect to be the last fundraise before the network goes live. We want to do this in a way that is sensitive to the wider community that cannot participate, while minimizing risks and overhead. To preserve the foundation’s endowment of tokens for later use, and in pursuit of wider distribution after network launch, DFINITY will restrict the private Presale fundraise to disbursing no more than 4.75% of the genesis tokens for a maximum raise of 90M Swiss Francs. Consequently by network launch, hardly more than 10% of the network will have been distributed to accredited investors who participated in private rounds (including the tokens disbursed by the Strategic round, which came with a three year vesting schedule and tied contributors to commitments including contributions of funding and management support for the DFINITY Ecosystem Venture Fund). DFINITY has received inbound interest from hundreds of private accredited entities such as hedge funds in the past few months. We cannot use automated processes to handle tokens sales because new Swiss guidelines would then classify the sale as an ICO. We will therefore process the indications of interest received manually and practical considerations mean we will not be able to speak to everybody. Please note that the team will not be taking any additional inbound for this private Presale. We shall aim to strike the right balance between distribution and expediency, but will focus on professional entities that fully understand the risks involved and/or which offer strategic advantages or supporting roles to the project. The DFINITY team is very pro Ethereum, which helped light the way towards the “blockchain computer” concept. Ethereum was funded by one of the first successful ICOs and demonstrated how funds can be raised from a wider community of enthusiasts in a way that allowed smaller investors to contribute towards an exciting technology project in the earliest stages. As the world began to understand the true power of smart contracts, the value of ETH network tokens appreciated dramatically generating tremendous excitement around the world regarding decentralization technology and ICOs — and a new paradigm was born. I remain a firm proponent of how ICOs can be a more equitable way to fund new projects, particularly the development of true decentralized networks such as DFINITY. Nonetheless, there has been a hiccup in the machine: during the great excitement of 2017, some highly promoted ICOs deliberately exploited information asymmetry and the market frenzy to separate regular investors from as much money as possible in unjustifiably egregious schemes. Some ICOs were uncapped despite numerous warnings, complex financial arrangements redirected ICO funds collected by non-profit foundations directly back to founders, team pages disappeared and more. We stood back bemused, dismayed and a little disillusioned because we felt more quality control was needed, and decided not to run an ICO to avoid a variety of risks. Unsurprisingly, these ICOs fed a negative regulatory narrative, and a backlash is now in swing. Even those whose motives were pure were not always mindful of the potential risks their offerings involved and some are now encountering problems. Our view is that although DFINITY has raised less money by staying on the sidelines, we anyway have sufficient funds for our current needs, maintain a larger token endowment that might fund operations for decades to come, and by avoiding problems have been able to maintain laser focus on developing Internet Computer technology and building out operations — and tremendous care is required to keep this true. Looking forward, it is clear decentralized networks and ICO fundraising generally still chart grey legal territory that is substantially ahead of the world’s regulatory frameworks. In 2017, regulators initially mostly took a light touch approach, reluctant to harm a fledgling industry while they improved their understanding of what was happening. Nonetheless, where securities law is concerned, one of their main areas of focus is protecting regular investors from being exploited and the shenanigans of 2017 unsurprisingly invoked their ire. The regulatory approach is constantly evolving, but for now they seem to have settled on conservative interpretations of the law, and their arguments have substance. We have to consider how this applies to DFINITY. The DFINITY Foundation is building the Internet Computer’s genesis state, which contains initial “dfinity” token allocations and other critical data necessary for network launch using smart contracts hosted on Ethereum. When the DFINITY client software is ready it will create the Internet Computer network by scanning those contracts and effectively booting off the Ethereum network. We believe the network token allocations recorded in these contracts represent part of our network even though the network does not yet stand independently. Nevertheless, a conservatively minded securities regulator might well argue that they are in fact investment contracts that investors are buying because they expect them to have value once the network has launched (and they more clearly become network utility tokens). These opposing perspectives each have their own merits and the nuanced arguments would require tens of thousands of words to explore properly. What can be said however, is that the sale of securities to the public is highly regulated, the regulatory environment has become hostile, and if the DFINITY Foundation ran an ICO today that made its genesis tokens available to the American public in exchange for cash (cryptocurrency or otherwise) we might very well be on the losing end of litigation. While we and project fans justifiably feel this is deeply unfair, many already agree the project is too important to risk distracting. The irony of the situation is that efforts by regulators to protect the public also restrict its access to legitimate projects leaving it with poorer choices. DFINITY is mitigating the situation by running an airdrop and limiting the tokens disbursed in private fundraises before network launch. We look forward to ICOs becoming a better option for exciting projects in the future as the regulatory environment becomes clearer, and support other projects who continue to responsibly apply the mechanism.